aims to keep families together by promoting helpful skills for parents, caregivers, professionals and para-professionals to build resilience in families and communities so all children thrive. We work closely with parents and caregivers, throughout Mendocino County, to ensure that all children are happy, healthy and ready for kindergarten. We do this through our Raise & Shine Program, which educates parents and caregivers about positive parenting and connects them to other needed community resources. Raise & Shine promotes the evidence-based parenting program known as Triple P (Positive Parenting Program). Our program offers both direct services to caregivers and parents and Triple P trainings to community and Child Welfare agencies, schools, pediatricians and mental health providers. 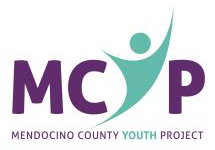 (MCYP), or “The Youth Project,” was begun in 1974 by the Mendocino County Probation Department, supported by community advocates and local educators seeking solutions for youth who were having difficulty at school, in the community or in the home. MCYP became autonomous as a joint powers agency in 1992. MCYP programs include prevention and early intervention services through its Youth Action Program; counseling services and mental health support for young children and youth up to age 24 and their families; and transition age youth services. (RCS) is a non‐profit, organization serving children and families in Mendocino, Lake and Sonoma Counties. Incorporated in October 1995, RCS began as a Foster Family Agency with a vision to grow and expand services to children and families in our communities. RCS has grown into a multi‐program “Family Service Agency”. Our purpose is to provide placement, permanency, counseling and community service options for children through a family sensitive, child focused, strength based approach to care. Our goal is to strengthen families and empower our communities’ most vulnerable children through programs and services that benefit in building a healthy and whole community…one child and one family at a time.